If you do any cooking at all then at some point you will need to use a can opener. They aren’t complicated nor do they have lots of fancy features, but they are an absolute necessity. Most people will do quite fine with a mechanical, hand-operated unit or in other words a manual opener. 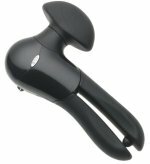 For those with arthritis or lacking hand strength then you might want an electric opener which are very easy to operate. There are also two main types – the traditional top-cutting models and side-cutting models, which also may be referred to as smooth-edge can openers. Top-cutters usually leave a sharp edge to the lid, while side-cutters separate the lid at the seam thus leaving a smooth edge. The best versions open all sizes of cans easily without a lot of physical effort, work for both right and left-handed people, attach to the can so it can’t become separated while operating, and provide a mechanism for lifting the lid away. We reviewed manual and electric models to find the best manual can opener and the best electric can opener which we review below. If you are looking for the best cheap can opener that is also made in the USA then look no further than the EZ-DUZ-IT Deluxe which sells for under $12. It is a classic swing design made from heavy gauge chromed steel and features a carbon steal cutting blade and nice, thick rubberized handles for an easy grip. This thing will last a super long time thanks to its quality components and the fact that it is made in America. On the downside it is a very basic model and it does not have a magnet like some of the more expensive models so the lid can fall down into the can. If safety is a top priority for and you do not want sharp lids then we highly recommend the Oxo Good Grips Smooth Edge Can Opener which is available for $21.95. This side-cutting model leaves a smooth edge so you don’t have to worry about cutting yourself on the lid. One other advantage of this Oxo unit is that the cutting wheel never comes into contact with the food inside the can. It has a stainless steel cutting wheel and soft non-slip handles. The biggest negative to this one is the price. It is the most expensive manually operated model on our list, but that is the price you have to pay for leaving a smooth edge. 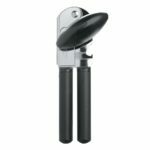 The $14 Oxo Good Grips Can Opener is one of the highest rated manual can openers available on Amazon and was one of the top selling models as well. What makes this opener so good is the large, oversized, knob and cushioned handles that make it easier to open cans – even for older people or people with small hands. The $16 Zyliss Lock-n-Lift is another solid choice for a manual can opener. It has a locking mechanism and magnet which lifts the lid off when cut, unlike many cheaper models. However, the biggest drawback is that the magnet really is too weak and doesn’t always work the way it should. Users on Amazon rate this Zyliss opener quite well and it is the best selling can opener on Amazon. If price is the primary concern then check out the $8 Amco Swing-A-Way 407BK. This unit is nearly identical to the EZ-DUZ-IT, but this model is made in China and some users have complained about the lack of quality, although it still has a pretty solid overall rating from users on Amazon. The main advantage is that it is does not cost a lot, and even if it does not last long it is cheap to replace. 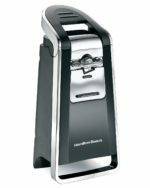 We chose the $27 Hamilton Beach 76606ZA Smooth Touch as our best electric can opener because of its ability to open large and small cans with ease and its safe side-cutting design which leaves smooth edges. Its operation is super easy and the cutting blade never touches the contents of the can. It also does not spill liquids, which is a big complaint from user of electric models, thanks to its smooth operation. We highly recommend this Hamilton Beach unit to the elderly, especially with its safe cutting system that leaves no sharp edges to cut yourself on. Just be aware that you will need more countertop space to store this machine and it obviously costs more than manual options. Buyers should note that this model is the same as the Hamilton Beach 76607, but that model comes with Stainless Steel scissors and storage slot. 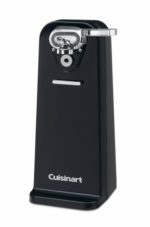 The cheapest electric can opener to make our list is the Cuisinart CCO-50BKN Deluxe Electric Can Opener which sells for under $18. It has a simple press and release lever to activate and a magnetic lid holder. This Cuisinart model does a decent job overall, but the quality of the components is a bit lacking, meaning it probably won’t last as long as some more expensive models. 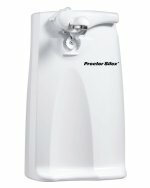 Another cheap electric can opener option is the $20 Proctor Silex Plus 76370P. It works well enough, although does not compare with our top choice, and is designed to handle tall cans. The main advantage is that it is cheaper than other top-tier models, while still receiving a rating of 4.3 stars from users on Amazon. The biggest negative is that some users have complained that this Proctor Silex model tends to spill the liquids inside of cans all over the place.